Smeader braves the cold after being dusted in snow. Winter has finally found it’s way to Oklahoma. While incredibly low temperatures haven’t stuck continuously, Oklahoma has already had its first snow of the season. Lake Tenkiller hasn’t always been known for being a winter hot spot; however, the views between fall and winter can be absolutely breathtaking. Situated at the foothills of the Ozark Mountains surrounding Lake Tenkiller, Terrapin Peak proves to be an excellent location to view winter’s arrival. With the remaining leaves shedding in fall colors, the contrast of the white snow creates a unique atmosphere. 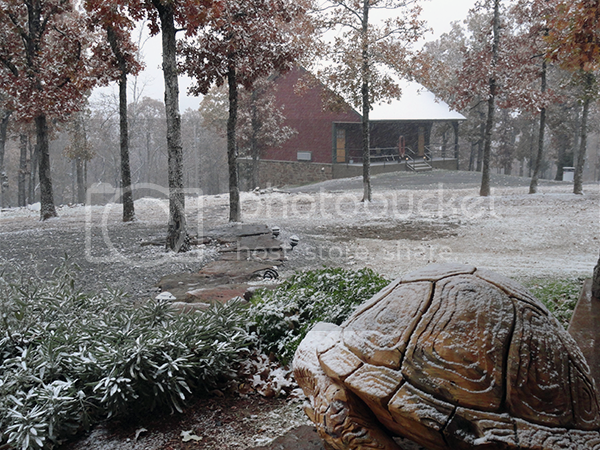 Snow gently falls on the “Snappy Turtle” cabins. Built on what was previously 9 acres of virgin woodlands, Terrapin Peak allows visitors to slip away from the struggles of city life and enjoy winter in a natural setting. Our expert staff will go above and beyond to give you a warm experience to make you forget about the cold. 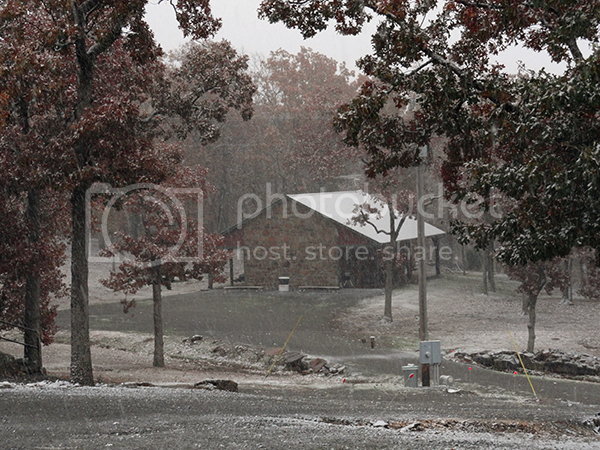 This entry was posted in Winter and tagged Bed, BnB, Breakfast, Cabins, Lake Tenkiller, Oklahoma, Snow, Terrapin Peak, Winter by Casey Owens. Bookmark the permalink.